Broken teeth can happen to anyone, at any time. Whether the break or fracture occurs during a Sunday afternoon football game or over dinner on Tuesday night, any kind of dental injury can be frightening and leave you not knowing what to do next. Your emergency dentist in Brookfield wants to help you be prepared for the unexpected. Keep reading to find out what to do after a broken or fractured tooth! Broken and fractured teeth can happen for a number of reasons, liking biting down on something hard, suffering a blow to the face, falling, or having weak teeth or old amalgam fillings in the smile. A fractured tooth is one that has cracked but remains intact. This injury ranges from very minor to severe, and may or may not cause pain. A broken tooth may be slightly chipped or it could be broken almost all the way to the gum line. Minor to moderate breaks may not hurt — but you will feel a sharp or pointy spot when you run your tongue over the area. If, however, the inside of the tooth (the pulp or “nerve”) is damaged, you will likely feel pain chewing, or when it comes into contact with heat, cold, or air. Perhaps the most important thing to remember if you or someone you love have broken or fractured a tooth is to remain calm. It is difficult to think clearly if you feel panicked — but knowing you can call on your emergency dentist at Elmbrook Family Dental will help you keep your cool in the face of any urgent situation! Here are some important next-steps to take after you experience a broken or fractured tooth. Find and store any large parts of the tooth for possible reattachment. Rinse the mouth with warm salt water to remove any shards and help prevent infection. If the area is bleeding, apply consistent pressure with a clean gauze or cloth. Apply an ice pack in 10-minute intervals to reduce swelling. Take an over-the-counter pain medication as needed to reduce discomfort. 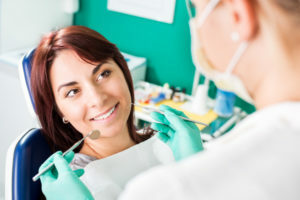 When you come into Elmbrook Family Dental with a broken or fractured tooth, your dentist will evaluate the situation and determine the best method of treatment. For teeth that have sustained very minor cracks, it is possible that no treatment is needed at all — a simple polish can improve the appearance of the tooth. Moderate damage may require an inlay/onlay. If the tooth’s root has been damaged, root canal therapy or a dental crown may be needed to renew form and function of the tooth. No matter the restorative treatment you need, feel confident knowing our team will get out out of any pain and on with your life as soon as possible! If your emergency occurs during business hours, please do not hesitate to get in touch with Elmbrook Family Dental. Your dentist in Brookfield will fix your tooth ASAP so you can get back to living your life! Contact us right away the next time a dental emergency happens to you or someone you love.